While the beach may be the soul of Takapuna, Hurstmere Road is perhaps it’s commercial heart. Working in Takapuna, it’s a heart I know well (in fact at the time this post is published I’m probably walking along it to get some lunch) and it could definitely do with a bit of love. 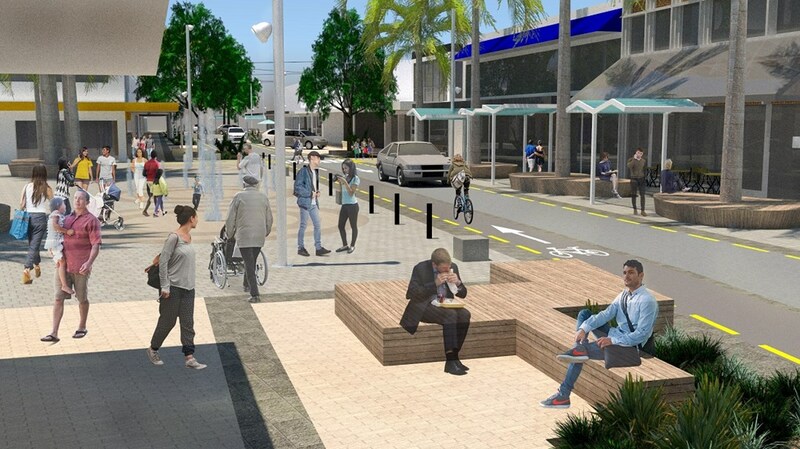 The upgrade of Hurstmere Road was identified as a key project in the (former North Shore City Council’s) Takapuna Strategic Framework, which set the vision for developing Takapuna. It was also identified in the Auckland Plan as one of the key metropolitan centres for growth and development. Hurstmere Green’s recent redevelopment, with a more convenient and natural flow of people between the beachfront and the shopping area, will be enhanced by making Hurstmere Road a more people-friendly space. Hurstmere Road already enjoys a large amount of foot traffic, which is set to increase from population growth and intensification in the area. In order to effectively develop the Takapuna town centre, we need to improve pedestrian facilities to move a greater number of people. The streetscape is also due for an upgrade from a maintenance and quality perspective, with additional issues around sidewalk quality, overshadowing, street lighting, bird nesting, and vegetation. This project provides an opportunity to install robust infrastructure that will serve the Takapuna community long into the future. The comments about needing an upgrade from a maintenance and quality perspective is a bit understated. The footpaths are in places an outright hazard with undulating surfaces as a result of both age and repeatedly being dug up by various service companies. While AT claim in their material that they’re ‘transforming’ the street, I don’t think I’d quite go that far. To me, what’s planned doesn’t quite meet the dictionary definition of “make a marked change in the form, nature, or appearance of“. At the core of the upgrade, AT plan to reduce this section of Hurstmere Rd to a single northbound traffic lane with a 30km/h speed limit. Southbound traffic will need to use Anzac St and then Lake Rd. This should help reduce some of the vehicle dominance that can often occur, especially southbound due to the intersection with Lake Rd. This remaining lane is also intended to be level with the footpath, which they claim “will help create a low-speed environment and encourage a more natural flow of people between restaurants, shops, and other businesses“. However, it’s not actually a shared space and so will feel much more like a road and I’d expect drivers to treat it accordingly. As such, while it definitely will be better than what exists today, I’m not convinced it will quite live up to the expectations AT claim. Along with reducing the traffic lanes, AT are also proposing to half the number of carparks on the street from 56 to 28. 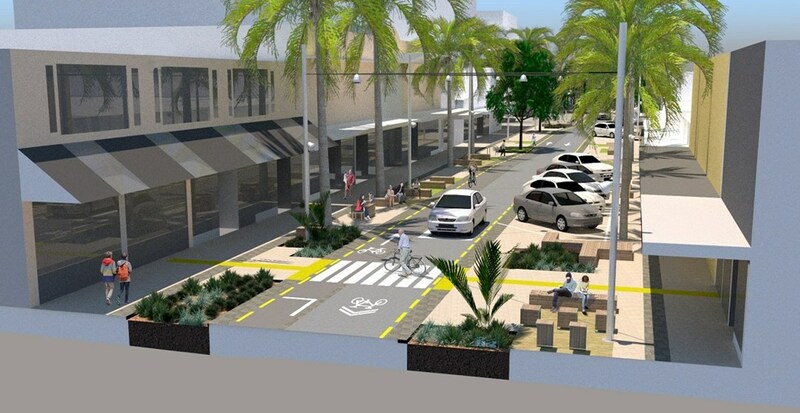 This is expected to see the amount of space on the street dedicated to roads and parking reduced from 48% to 25%. While the road will be changed to one-way for cars, AT also plan to install a 1.5m southbound only cycle lane so that those on bike can travel in both directions. They say it will have “a different surface material and clear separation from vehicle traffic” but it’s not clear how that separation will work given they also say the road will be level. It seems more likely drivers will just ignore the cycle lane and use it for car parking. The is also intended to allow for Hurstmere Rd to easily be used for events and markets and would be a logical place to put the Sunday markets that will need to move from the Anzac St carpark. Let’s see what AT have planned. The legend applies to all images. At the Lake Rd intersection, AT plan to not only remove the left turn slip lane but prevent left turns altogether. These changes will also likely simplify this intersection and allow for a faster cycling of the Barnes Dance that exists which would be good. The pedestrian crossing shown is new and a welcome addition. The northern end of Hurstmere finally gains a zebra crossing, so too does Anzac St and The Strand. The latter of those will finally mean the removal of the “motorists have the right of way” signs that currently exist. Again, there does appear to be quite a few trees that could be being removed to provide for parking. 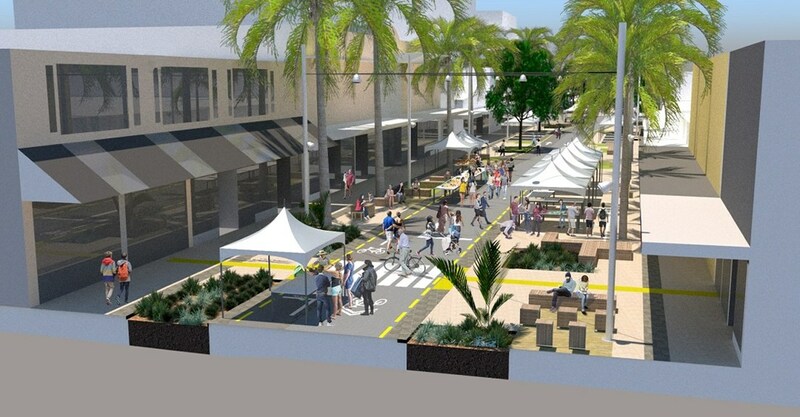 Here are some design images from ATs website, they also include versions where the road has been closed for markets. What do you think of the proposal? The consultation is open until Tuesday, 3 October 2017. There’s also one more open day this week on Wednesday. I don’t have time to check out the other ones Matt has spotted. AT, it’s easy. Just design AROUND the trees. You’ve shown you’re willing to take out road lanes and to weave the lanes slightly from side to side, so it is possible. Nay, valuing the ecological base we rely on is crucial. I don’t like the road at the same level as the footpath. I think that’s a choice made to make a trendy funky feel. Some cultural conventions like kerbs make it easier to keep children safe. If you want it to feel like it’s a pedestrian street, remove the cars. While the proposed upgrade is an improvement on the current state, I think it really lacks ambition. Surely this length of road is an ideal candidate to be pedestrianised. All that’s needed is a few accessibility parking spaces at either end and then the rest should be given over to people on foot. I come from a market town in central England that pedesrianised its main shopping street in the late 70s. Ever since then, 2 or 3 times a week the whole street is given over to market stalls, pretty much doubling the number of retail outlets (and shoppers) on those days. I agree 100% – Hurstmere Road has been crying out for pedestrianisation for years, and now is the opportunity to do it. The Takapuna commercial precinct could do with a lift, and making it a proper people space would be a great start. Look at the event sketch above to see how much more activity could be going on with the road closed to traffic. Interesting and certainly needed – as you say the footpaths along there are “uneven” (if I am being polite). I think you are correct to highlight your doubts about the road and how it will be viewed / used by drivers but think that it is likely that delivery / courier drivers will simply end up blocking the road and, as such, local drivers will simply avoid it. 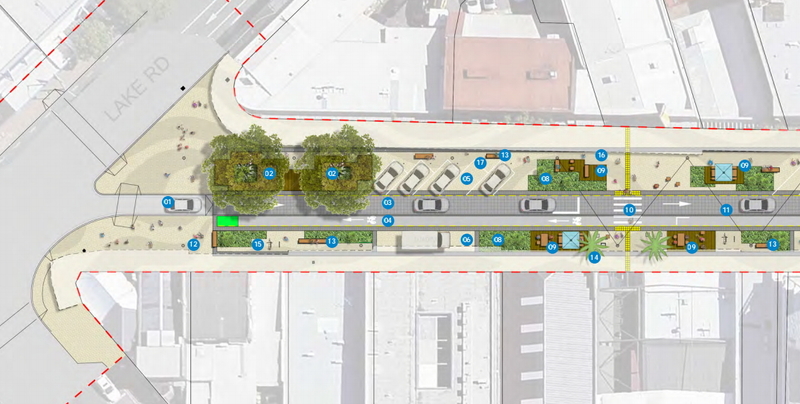 Most interesting is the image showing the market option on the road and I wonder if this is AT’s view of what will happen if / when they hand over the Anzac Street car park for development. Does Hurstmere Green still have a foul smelling tree that makes people avoid the place some months? I think that was George Wood. No need to be so mean to old George there, goosoid. As North Shore mayor he pushed through more public transport upgrades than the new Auckland Council has managed both in it’s first seven years and planned for the next seven combined. Credit where it’s due. I’d have him (and the old councils) back in a heartbeat. Looking at those diagrams it strikes me how easily a couple of nets could be put in, with good artificial on top of the concrete. Running parallel to the roadway. Put some permanent stumps in and you’ve got some great facilities to get a good session in during the day. Maybe have a max 10 overs (60 balls) for a bat. So they are building Elliot Street circa 1995. A traffic rat run lined with parking and bollards. Why bother exactly? Big problem will be keeping traffic slow on both Hurstmere and particularly The Strand. Aggressive judder bars required on the Strand which is a bit treacherous now given the curves and closeness to the beach/playground. Also reckon that something will need to be done about the roundabout at the North end of hurstmere and Anzac as the one way flow from Hurstmere (which has right of way over buses that are required to use Anzac) could potentially become even more of a nice rat run for cars. Need some clever person to come up with a plan to divert through traffic away from this area. Say have 2 pedestrian phases per cycle on the Lake – Hurstmere lights and 30 kmh limit over the whole town centre. ANZAC between Lake and Hurstmere should be included in the plan. Widen the footpath on the sunny south side for outdoor eating for all the eateries there, Could narrow the footpath on the north side if need be. Make one way as well. 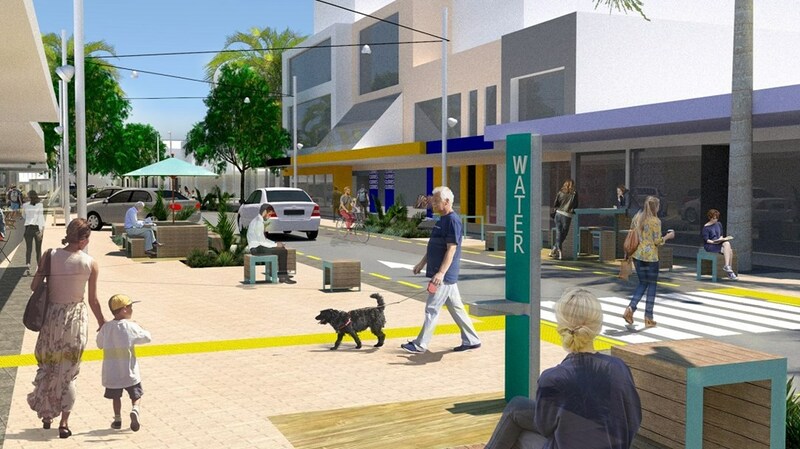 Glad that they’re proposing to do _something_ about that street, however as others have said – Pedestrianising the road would’ve been better, though with the possible outcome of forcing even more traffic onto Lake Rd. Also, It’d be nice if they could realign the northern intersection a little, could probably gain another metre of footpath with no left turn into Hurstmere from The Strand (Nth). This would also make The Strand even less inviting for cars. Perhaps even make The Strand one-way (Nth, Sth) with more traffic calming measures, that way you’d gain almost 3 metres, which could make a nice small public space and drag people into the next block. I think that a real cheap win, would be to string lights across the road kinda like Commerce St in the city. It should work in well with the walk-thru by “The Commons”. Provide a more village feel. I pity the Sunday market though. Whilst it’s grown to be a bit too large for that space, it’s a great thing to have and I can’t imagine that businesses _wouldn’t_ be fans of it. I guess since they’re dead set on redeveloping the car park, perhaps they could move the market to Hurstmere + The Strand? That is exactly the plan, the market will be held along Hurstmere and in the lanes and square of the new development. So better than it is today. The people campaigning for ‘save the carpark’ are simply lying when they suggest the market is at threat, that has never been the case as the development was specifically planned with the market in mind. Cool – Thanks for letting me know! Do “sidewalks” exist in New Zealand, in a legal sense? What is wrong with footpath? Language is an evolving thing, taking in new words from other languages and countries. Sidewalk is one such word. Accept change. Sidewalk is a useful word. In the US it means footpath and in New Zealand it indicates the person using the word is a moron. Sidewalk is a useful distinction for footpaths at the side of a road, as opposed to footpaths along the beach, through a park etc. In NZ though, we’ve called the ones at the side of a road a footpath, and the ones along the beach, through a park etc, a “path” or a “walking path”. I think the NZ traditional terms are still in most common use, so would prefer them to be used in any official document. Definitely not a biggie for me. Is it reasonable to suggest or think of making the angle parking spaces so the vehicle backs in as per the Ausie towns are doing? I like the idea, generally, as it makes getting out into traffic much better. And I’ll keep it in mind if I’m putting in a submission on another design sometime. But this wouldn’t be the project I’d push for it on, because they’re putting the footpath level with the road. Backing in towards pedestrians – including children you can’t see, and who don’t necessarily notice the difference between the road and the footpath – sounds like a horrible accident waiting to happen. Certainly it wouldn’t be any area I’d choose to go to with young kids. Unfortunately there is no serious commitment to pedestrianizing Takapuna. A 450 space car park is proposed for the gasometer site because demand for short term parking is projected to increase by a third. I suspect in practice this will become like the Ronwood carpark i.e. a huge drain on rate payers because the revenue simply does not provide an acceptable return on investment – I seriously doubt whether there is any return on investment. As we have learnt from an excellent post of last week a city centre (Auckland city centre) can be revitalised by the traffic count to the area remaining static and access by other means. Takapuna can become a much more pleasant and vibrant area by utilising the current public transport networks from the City, Devonport, Milford and Smales Farm. Eventually AT may even introduce the new northern network to assist with this. Somehow of course accessways will also have to accommodate all the cyclists from the Seapath. 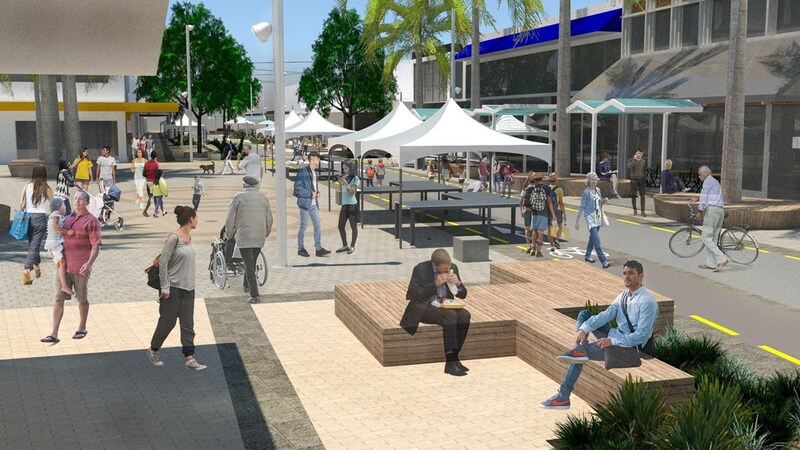 Let’s have a 21st century metropolitan centre where energy emissions are considered; people are encouraged away from their cars so that they have a longer daily walk than from the garage; and people can amble around enjoying the pleasant surrounds that Takapuna offers. I wish they’d pedestrianise it. I’ve lived in or near Takapuna most of my life and worked there for most of my career too. I used to work in a shop on Hurstmere road and would see the traffic build up from one end to the other when it was a red light. Not many cars can park along there, so most are just through traffic. So many people will double park by the 5 minute parks by Hurstmere Green to “just” go to the ATM, post office etc making traffic even worse. Would make a more pleasant environment to shop, work, do business in. If Hurst mere was pedestrianized people could drive via Anzac rd and Lake road OR drive around the Strand (on the waterfront). Not saying this is good or bad just that this is likely to happen. The Europeans have measured effects from road closure in exactly this type of situation. Conclusion: traffic evaporation. In pedestrianising Hurstmere, I think the Strand should also be looked at, making it a no through way. I.e. some of the car parks can be accessed from the Lake Rd end, and some from the Anzac/Hurstmere roundabout, but for it not to be possible to drive from one end to the other. I imagine this break in the road to be a 10m wide walkway in the approximate location of the current, vile, ‘motorists have right of way’ sign.